1. 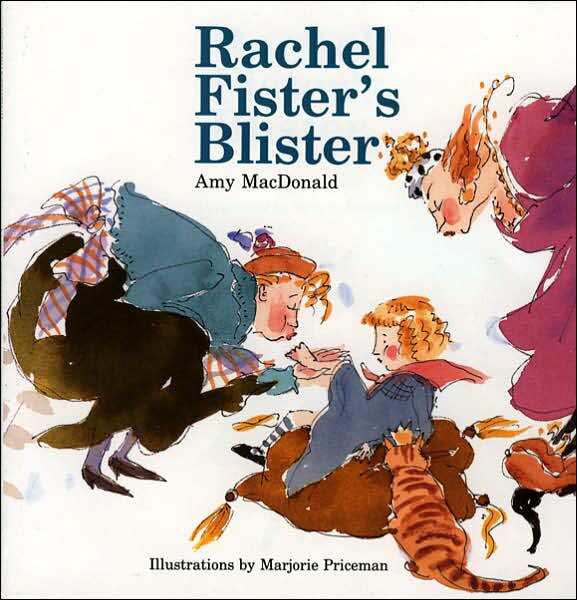 Music: Try singing Rachel Fister’s Blister to the tune of “Clementine.” Now try it with Cousin Ruth’s Tooth. What does this tell you about the rhyme scheme of the two books? Talk about how many syllables there are in each line, and where the emphasis falls on each word. c. Next make a list of “titles” (Mr., Mrs., Doctor, Miss, Ms, Vicar, King – refer to the book if need be) and fun first names: Wally, Harvey, Wanda, etc. e. Try writing a story about it, in rhyme if possible. 5. Drama: Put on a play, adapted from Rachel Fister’s Blister. 6. Drama: Do a Reader’s Theater read-aloud adaptation of Rachel Fister’s Blister. Click here for directions and a sample script.